Many investors see the growth potential in China, but do you have a China Investment Strategy? It’s certainly important to know where you are going to invest, but equally important to know the right vehicle to invest in to maximise returns. Investment theory would say that you can capture the most return by investing in higher risk asset classes. But do the returns in Chinese markets corroborate that? For a high growth market like China, the initial reaction would be to base your China Investment Strategy on equity investments. Equities give you a share of the business and scope for capital appreciation as the company grows. With fixed income investments, your upside would be capped at a fixed yield, although in theory the investment should be safer than an equity holding. Another line of thought would be to base your China Investment strategy on the underlying commodities that China needs in order to continue growing its economy. This school would argue that the equity market is not fully developed in China: a lot of the fastest growing companies are not listed and the ones that are might not flow profit down to the end shareholder. So why not simply avoid all these problems by investing in the underlying commodities that China needs? 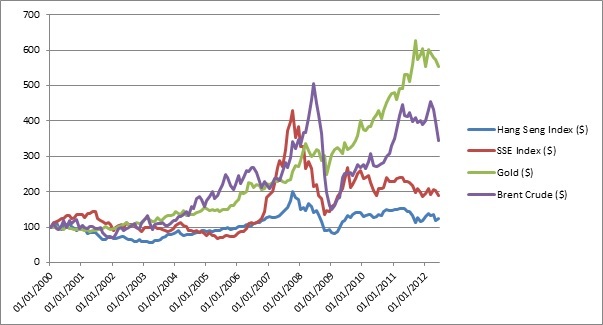 So how have Chinese equity markets performed relative to commodities? We’ll look at two of the most demanded commodities by the Chinese: gold and crude oil, relative to two of the most common equity indices in China, over the period 2000-2012. It’s fair to say that commodities have knocked the pants off the Chinese equity markets, as reflected by the domestic SSE composite and the Hong Kong based Hang-Seng index. Although the SSE index did have a flurry in late 2007, it has been outperformed by gold and crude oil for the rest of the decade and has performed particularly poorly recently. I can think of two reasons why the Chinese equity market just hasn’t been able to keep pace with commodity markets. The first one is simply that the highest growth companies are choosing not to list on the exchange. Many of these companies will find financing readily available through the banking system or private equity firms. This may be a cheaper way for the company to obtain finance, whilst meeting their objective of maintaining a high rate of internal growth. A second reason is that with a relatively unregulated market like China, it may be that shareholders are getting a raw deal from the boards of these companies. Although revenues are high, much of this could be skimmed off through expenses and salaries and so the shareholder gets a raw deal. Unless you are a large shareholder, you are not in a position to dictate how the company does its accounting. Whether you invest in Chinese equities through the domestic market or through Hong Kong, the returns have been outstripped by commodity markets. For a combination of reasons described above, investing in equities is not an optimal investment strategy for china. I would instead consider the commodities that China needs in order to continue its growth. Both gold and crude oil prices have appreciated strongly in line with domestic Chinese growth and they offer hassle free upside without the complexities added by equities.